Last week I left with you my choice of deciding whether I should go and watch QPR, Harrow Borough or Dulwich Hamlet on Tuesday night. The latter two were playing away from home and QPR were on my doorstep, they were also the most expensive option or so I thought. After a bit of umming and ahhing I decided to investigate the QPR ticketing situation on re-sale site Twickets. A lot has been made of re-sale sites recently with the government actually thinking of getting involved to make vastly overpriced tickets a thing of the past. Twickets are, however, different to the likes of Viagogo and StubHub as they only allow tickets to be sold for face value or less. For some reason, QPR are one of the only clubs in the country who have an official relationship with them and it was very much to my benefit. With the R's in midtable and Tuesday night's opponents Barnsley hardly box office (no offence), there were a number of tickets available for well below face value so with walk-up prices at a staggering £37 I thought I'd give it a go. In the end I landed a seat in Ellerslie Road for £25 including fees. I then simply went to the box office who printed it out and gave it to me. Job done. The game itself was also pretty decent with chances aplenty at both ends. QPR opened a 2-0 lead midway through the second half but faded a bit, let in a goal and hung on doggedly through five minutes of injury time for well-needed 2-1 win. I can't really see why I'd buy through the box office again after an experience like that so I'll see what Twickets has to offer the next time I'm free for a game. Oh and as for Harrow and Dulwich, they both lost - heavily in Harrow's case so it turned out to be the right decision in all respects. 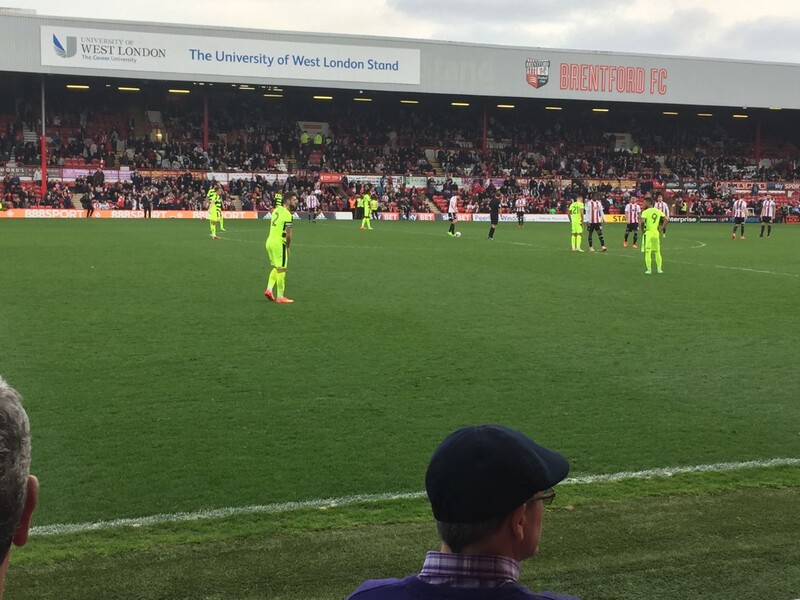 In other news it was great to hear from TLFG reader Wayne who went to Brentford on Saturday to see their game against promotion chasing Huddersfield. Wayne - thanks a lot for the email telling me how it went and for the photos. Another reader Simon, a regular on the Facebook page, posted a picture from his visit to Colliers Wood United for the A3 derby against Raynes Park Vale - thanks to you too. Lastly this week I'd like to give a special mention to all the QPR fans taking part in Tiger Feet Walk 8 on Saturday. This annual walk, which I helped set up in 2010, sees a group of supporters walk to a game to raise funds for the club's Down's syndrome football team - the QPR Tiger Cubs. Apparently we've raised more than £75,000 over the years which is pretty good going even I do say so myself. This year, they'll be walking from the club's training ground near Heathrow to Loftus Road for the match against Rotherham. It's not the most inspiring route so hopefully people will realise that and give generously. I'm working this year but might get out just in time to join them for the final mile or so. There are over 90 matches in the London area over the next week with action in the Premier League, FA Cup, EFL, National League and several minor league and county cup competitions. Tower Hamlets v Ilford @745pm - Friday night football is becoming a bit of a thing in the ESL and I love it. It's a great chance for some of the smaller clubs on the east side of town to grab a bit of the limelight when there's little else on. I went to Tower Hamlets v Clapton last season which drew a big crowd and produced a cracking game. Rather than sit at home and watch EastEnders on TV, head down to Mile End and become one for the night! Fulham v Wolverhampton Wanderers @3pm - with back-to-back home games against struggling Blackburn and Wolves, the Cottagers will be kicking themselves if they don't end the week in the top six. Games between these two are usually action packed with the last five producing a whopping 25 goals! James thanks for your great guide to the football in London each week. It certainly makes it easier to find out what's on especially with the non-league matches. Thanks a lot Tony - much appreciated. Thanks for the heads up about the Arsenal vs Man City reserve game. For £4 it was great value, and a good opportunity for tourists and locals alike to get into the Emirates to see a game at less than 10% of what they'd usually have to pay! We were rewarded with a great game, which ended up 3-3 with some good attacking from both sides. The crowd was a few thousand, but I missed the exact number, it was x thousand 9 hundred and something according to the announcer. Probably 1900 but could've been 2900! Thanks again for the notice about this game, and of course for the info about all the games every week, it's really appreciated. Thanks a lot Huddo and thanks for taking the time to let me know how you got on at the game. As you might have seen, there's a game at Stamford Bridge this weekend which is only £5 to get in so another great chance to see one of the big stadiums on the cheap.